Physical Description: Strong, athletic build. Looks all of his listed 6-foot-4, 225 pounds. Minimal remaining projection. Strong upper body and core. Well proportioned, looks the part. Hit: Made a mechanical change after signing with the Red Sox, returning to his stance and pre-pitch setup from 2015 when he excelled in the Cape Cod League. Starts slightly open with his hands high and up by his shoulder. Utilizes a leg lift timing device. Brings leg up and down quickly, ending up in a good hitting position. Has solid separation in his swing, and when he lands and transfers his weight, he brings his hips through quickly with a stiff front leg, allowing for significant torque. Above-average bat speed. Swings on a slightly uphill plane. Gets good extension and is comfortable getting his arms out and driving the ball to all fields. Approach needs some refinement. Lot of swing-and-miss in his game. Aggressive; likes to attack the ball. Pitch recognition needs some work; will get caught out in front too often against breaking balls, especially when behind in the count. Bat will be tested by more advanced pitching and will need to make the necessary adjustments. Will always have swing-and-miss in his game, but if he can keep strikeouts at a manageable level, has the potential to develop into a below-average hitter, capable of hitting in the .240 to .250 range, although it is more likely that his hit tool will play below that. Power: Plus-plus raw power. Among bats with best power potential in the system. Will put on a show in batting practice and has shown the ability to drive the ball out of the park to all fields with ease. Has shown the ability to actualize into game power when he keeps strikeouts at a manageable level. Natural lift in swing. Drives the ball with backspin. Ball jumps and carries off his bat. How much power actualizes will depend on hit tool, but has the ability to hit 30-plus home runs a year if he can make enough contact. Arm: Plus-plus arm strength. Touched the mid-90s off the mound in college. Plenty of arm for third base, able to make all the throws including balls fielded on the foul line. Field: Hands work well and footwork is usually reliable. A little stiff and has some trouble getting down on ground balls when charging the ball. Doesn't have great range, but makes up for that somewhat with his length, allowing him to cover more ground than his feet would normally allow. Has made great strides since he joined the Red Sox and now projects as an above-average defender at third base. Run: Well below-average speed, but not a true base clogger. Takes some time to get going, but able to go from first to third on a single when on the move. Career Notes: Starred as a two-way player at Arizona, including a standout performance in the 2016 College World Series as a starting pitcher in which he carried the Wildcats to a runner-up finish. 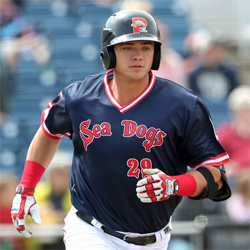 Has stated that he much prefers to hit and play third base, and credited no longer having to pitch for part of his breakout debut with Lowell in 2016. Participated in 2016 Fall Instructional League. Missed a significant portion of the 2017 season due to a broken hamate bone. Invited to MLB spring training in 2019. Summation: Ceiling of a first-division, major contributor who could slot in the number five or six spot in a competing team's lineup. Ultimate future potential depends on how his hit tool develops. Comes with more risk than a normal college performer, but factors such as his changed swing mechanics and sole focus on hitting - no longer having to pitch - work in his favor. Even though he has reached the upper minors still has a wide gap between what he is now and what he could be due to questions with hit tool. Very young for a three-year college player - was still 20 years old when drafted. Has the potential for two well above-average tools in power and arm. Hit and field are two tools that need the most work. Unlikely to ever hit for a high average and will always have a lot of swing-and-miss in his game, but teams will be able to live with that given his power potential. If he can make enough contact against advanced pitching, has the potential to become an everyday regular at third base with good defense who hits 30-40 home runs in his best seasons. But if not, he could struggle to make enough contact to be more than an up-and-down player.